Mobile Phones Fan: Google JellyBean Statue Loses His Head! 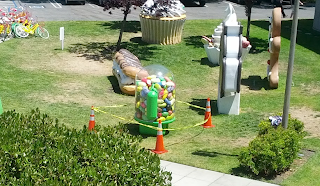 Google JellyBean Statue Loses His Head! Guess he heard about Apple's Galaxy Nexus injunction. In a sure sign that things are heating up at the Googleplex, a proud new member of Team Android has very publicly blown his top. 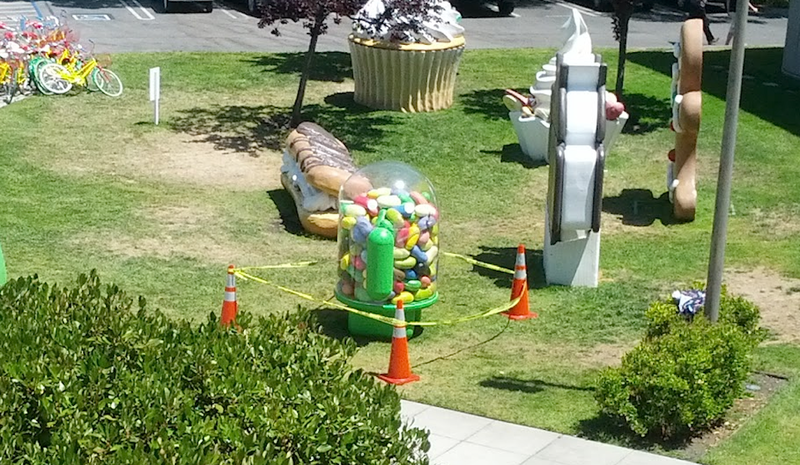 According to Android engineer Dan Morrill, the new Google Android "Jelly Bean' lawn statue has suffered a meltdown. Apparently, a buildup of hot air inside the statue caused his dome-shaped, transparent head to warp and pop off. Adding insult to injury, Morrill suspects somebody made off with one of the statue's ersatz jelly beans before anxious Googlers could seal off the area. In April of this year, heavy rains suddenly transformed Building 44's front lawn into a water wonderland. Because it's the one statue not anchored in place, the giant plastifoam Eclair (representing Android v2.0, the version behind Verizon's legendary Droid Does campaign) became a huge flotation device, bobbing around like some crazy Willy Wonka chocolate kayak in a puddle formed by six inches of runoff. Today, the cranially challenged Jelly Bean Droid sits forlornly among his green kin, awaiting repairs...and maybe some heat vent implants. As you can see in our lead photo, he's currently fenced off with traffic cones and crime scene tape. Morrill says the designer -- Themendous, of Jersey City, NJ -- is working on a security patch. Let's hope it's a good one; we'd hate to see the poor guy catch a summer virus.